Architect John A. Pearson conceived the idea of a Memorial Chamber in the Peace Tower as a national shrine: a noble tribute to Canadians who had given their lives during the Great War in France and Flanders. At a very early stage in the project's development, the architect decided to ask the British, French and Belgian governments to provide stone for use within the Memorial Chamber. In the summer of 1921, Pearson visited Europe and, on his own initiative, shared his project with officials in Great Britain, France, and Belgium. He showed them his architectural drawings and indicated the quantities of stone needed. In addition, he made trips to the main battlefields and arranged to collect stones at each site. His efforts were very successful: by August 1923, all of the stone required for the floor, walls and ceiling of the Chamber had arrived in Ottawa. For the Chamber's altar, Great Britain provided a block of Hoptonwood limestone. Belgium presented black marble for the wall plinths and altar steps, as well as Ste Anne marble for the clustered columns which support, at each corner of the room, the intricate fan vault. For the walls and vault, the French government gave Chateau-Gaillard stone: in Pearson's words, "one of the most beautiful stones of France." 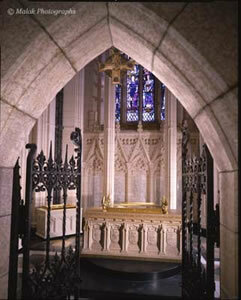 The Memorial Chamber is a solemn room which encourages reflection, a sense of peace and respect. It is remarkable for its detailed Gothic Revival style, which gives the small space a lofty appearance due to the exceptional height of its walls. Placed behind an open tracery screen, the outer walls consist of a blind arcade at the lower level, surmounted by magnificent stained glass windows. The commemorative nature of this unique shrine is strongly underlined by the provenance of its fine materials, and by its carefully planned decoration, from sculpture to stained glass windows. 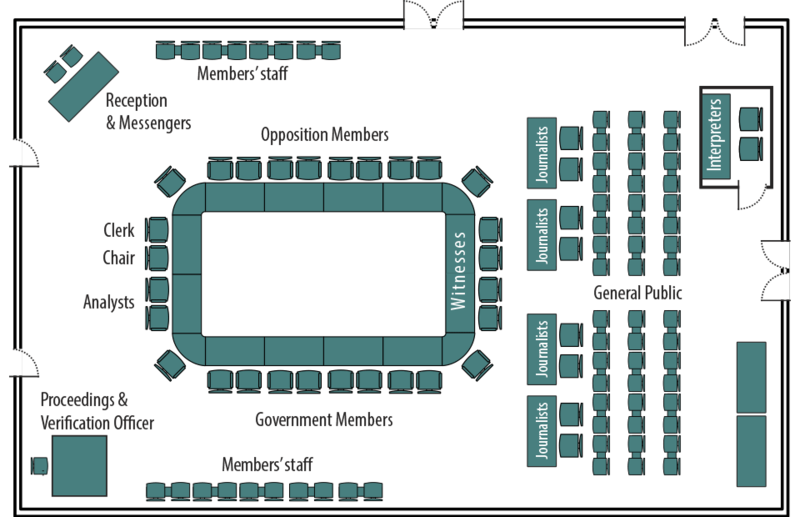 As designed, the focal point of the Chamber is an altar containing the Book of Remembrance that holds the names of over 66,000 Canadians who died during the First World War. Today, there are six more altars around the Chamber containing Books of Remembrance listing those who died in conflicts from the Nile Expedition to the Korean War, and in the service of Canada to this day.